A QSyntaxHighlighter implementation for use with QTextDocument. This supports partial re-highlighting during editing and tracks syntax-based code folding regions. Definition at line 43 of file syntaxhighlighter.h. Reimplement this to apply folding to your output. The provided FoldingRegion region either stars or ends a code folding region in the interval [offset, offset + length). The FoldingRegion region is always either of type FoldingRegion::Type::Begin or FoldingRegion::Type::End. Definition at line 180 of file syntaxhighlighter.cpp. Reimplement this to apply formats to your output. The provided format is valid for the interval [offset, offset + length). Make sure to set a valid Definition, otherwise the parameter format is invalid for the entire line passed to highlightLine() (cf. Format::isValid()). Definition at line 157 of file syntaxhighlighter.cpp. Finds the end of the folding region starting at startBlock. If multiple folding regions begin at startBlock, the end of the last/innermost one is returned. This returns an invalid block if no folding region end is found, which typically indicates an unterminated region and thus folding until the document end. This method performs a sequential search starting at startBlock for the matching folding region end, which is a potentially expensive operation. Definition at line 98 of file syntaxhighlighter.cpp. 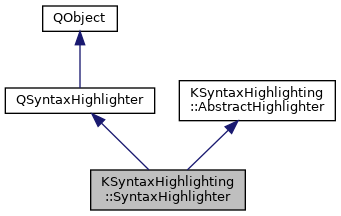 Sets the syntax definition used for highlighting. Subclasses can re-implement this method to e.g. trigger re-highlighting or clear internal data structures if needed. Definition at line 85 of file syntaxhighlighter.cpp. Returns whether there is a folding region beginning at startBlock. This only considers syntax-based folding regions, not indention-based ones as e.g. found in Python. Definition at line 93 of file syntaxhighlighter.cpp.